Pittsburgh – PennDOT District 11, Oakland Transportation Management Association (OTMA), Allegheny County Health Department, Oakland universities, and local law enforcement agencies today announced Oakland Safety Week, a week-long safety enforcement and education initiative in the Oakland community of Pittsburgh. ‘The Oakland Safety Week initiative at its core is intended to support on-going efforts to educate motorists, cyclist and pedestrians; promoting the message of Street Smarts, Don’t Be A Road Zombie thru the distribution of safety materials, safety enforcement activities and increase police presence.’ Says Mavis Rainey, Executive Director, of the Oakland Transportation Management Association. Through a “Seeing-Eye Guide Campaign”, University of Pittsburgh Student Government volunteers will work to raise awareness about the dangers of distracted walking. Community members are invited to stop by one of the three “Bicycle Safety Stops” to receive bicycle safety materials, free bike checks, university bike registration, and other bicycle materials compliments of Bike Pittsburgh. Bicycle Safety Stop Locations include the University of Pittsburgh Student Union Lawn in Central Oakland, Frances Ward Hall Lobby at Carlow University, and the intersection of Morewood Avenue and Forbes Avenue near Carnegie Mellon University. The City of Pittsburgh Police, University of Pittsburgh Police, Carnegie Mellon Police, and Carlow Police will participate in a day of increased traffic enforcement. The Pennsylvania DUI Association Safety Simulator will be parked in the University of Pittsburgh Union Driveway from 2 p.m. – 6 p.m. The DUI Safety Simulator will allow community members to feel firsthand how alcohol impairs your ability to steer and brake. 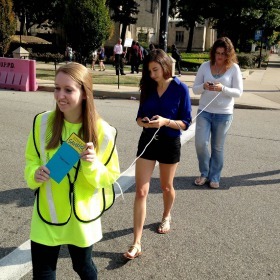 Open to all community members, the Oakland Safety Week Fair will be held on the University of Pittsburgh Student Union Lawn from 11 a.m. to 3 p.m. The fair will feature several vendors providing information regarding all aspects of traffic safety. Over the past 5 years, there have been 265 crashes on Forbes Avenue alone. 35 of those crashes involved a motorist running a red light, 39 involved a pedestrian, 6 involved a bicycle, 9 involved speeding, and 15 were alcohol-related.